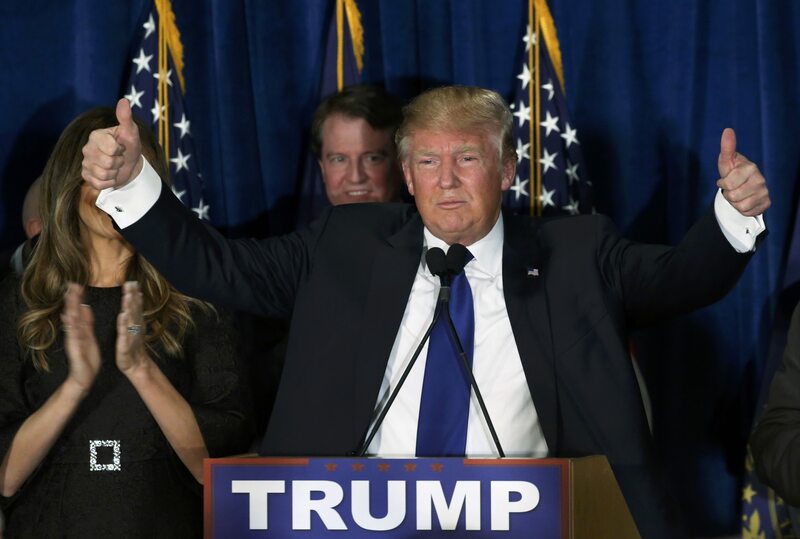 Businessman Donald Trump fulfilled the prophecy of the polls Tuesday night, notching a big win in the New Hampshire primary with his closest rivals trailing nearly 20 points behind him. With 75 percent of the vote counted, Trump was leading with 34 percent. Ohio Gov. John Kasich, who is estimated to finish second, had 16 percent of the vote. It was an important win for the businessman, after his lead in the Iowa polls evaporated into a second-place finish in the caucuses to Texas Sen. Ted Cruz. In his victory speech, Trump suggested that he had managed to turn around his New Hampshire ground game in the week since it hurt his campaign in Iowa. "We learned a lot about ground games in one week, I've got to tell you," Trump said. Trump warned that the Democratic winner in New Hampshire, Sen. Bernie Sanders, wants to "give away our country." "Congratulations to Bernie, in all fairness," he said. "We wish him a lot of luck but we are going to make America great again but we're going to do it the old fashioned way" -- by beating countries like China and Japan. He then launched into an abbreviated version of his stump speech, touching on immigration, trade, the heroin epidemic, the Second Amendment, and more. He wrapped up by saying, "Thank you new Hampshire, thank you! We are going now to South Carolina, we're going to win in South Carolina, I love you all, thank you very much." Trump's victory was fueled by a combination of late-deciding voters (20 percent of that group voted for him), first-time voters (34 percent) and those who considered electability a key factor (29 percent). He also did very well among voters who are dissatisfied or angry with the federal government (32 percent of their votes) and those who feel betrayed by the Republican Party (32 percent). He is also the top candidate choice for the other three issues: immigration (50 percent), terrorism (27 percent), and government spending (31 percent). Another notable statistic: 66 percent of Republican voters in New Hampshire support a temporary ban on Muslims entering the U.S, a policy Trump proposed in December. Forty-two percent of those voters backed Trump. CBS News Poll Analysts Melissa Herrmann and Jeanne Zaino contributed to this story.